The Friend Computer knows best and has your best interest at heart. The Friend Computer is crazy and will drive you crazy. Conscripted to the hit reality show Shooters (brought to you by New Bouncy Bubble Beverage ™) our team of Terrible Troubleshooters have successfully destroyed countless credits of Valuable Computer Property and have uncovered more clues about the mysterious Mr. Bubbles, who seems really concerned about getting off a list. Treachery! Conspiracy! Loyalty! Is Mandatory! Spam! 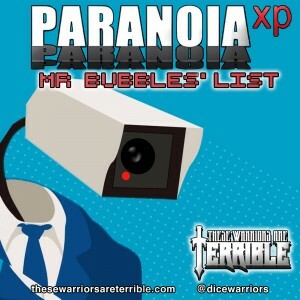 It's part three of the Terrible Warriors journey through the bogus bureaucracy of Paranoia XP.